The Melbourne Knowing Animals Reading Group is spending 2019 with foundational thinking that focuses on multispecies justice. We began the year with Cora Diamond’s seminal paper “Eating Meat and Eating People” (1978). This work, which responds to the early animal rights philosophy of Peter Singer, Tom Regan and others, suggests a rational philosophical approach may not be the most effective way to stop people eating meat. Diamond takes her readers a little way into the boggy depths of moral philosophy, and then, from that quagmire, argues philosophers fail because of ‘their emphasis on rights, on capacities, on interests, on the biologically given’ (479). Perceptions, she suggests, offer more traction for change than do rational arguments. To read this article as one might approach a philosophical argument is to miss its refusal of plot. Such writing creates a sense of freedom. There is something about the dialect (and the dialectic) of rational argument that feels ‘heavy in the mouth’ (mowson). Diamond breaks down this constraint by moving readers between disorientation and ‘moments of sense’ (McKay). Forty years later, there is still work to be done, with ‘some posthumanists’ leaning ‘toward scientific thinking’ while excluding ‘linguistic and cultural understandings’ (Neumark). In contrast, fictional and critical work is increasingly using language to create contagious affect (Pyke). It is understood that activism is most effective when arguments are put aside for stories that evoke personal and unique feelings; connecting through emotion creates a ‘validity’ that logical arguments do not achieve (Crosbie). Diamond’s ability to think ‘outside the rational animal rights master narratives’ reveals the ‘strange permeable boundaries’ that create ideas such as ‘a fellow creature’ (mowson). Humans operate from ‘internalised cultural conventions’ (Roudavski). Through formal and informal education, humans learn to make separations between their own species and others, and this most often begins at the family dining ‘table’ of childhood (mowson). Yet, as Diamond points out, such approaches are ‘not usable with someone in whom there is no fellow creature response’ (477). Some organisms, such as bacteria, are treated differently to others, because ‘human conventions are limited and biased: limited, because humans can only have cultural attitudes to things that their culture has perceived; and biased, because human cultures focus on human benefits’, with the result that things like ‘dignity’ are distributed ‘unevenly’ (Roudavski). This too may change. For example, humans are increasingly emotionally committed to ‘gut bacteria’ (McKay/mowson). The discussion then turned to the uncomfortable question of eating human meat. 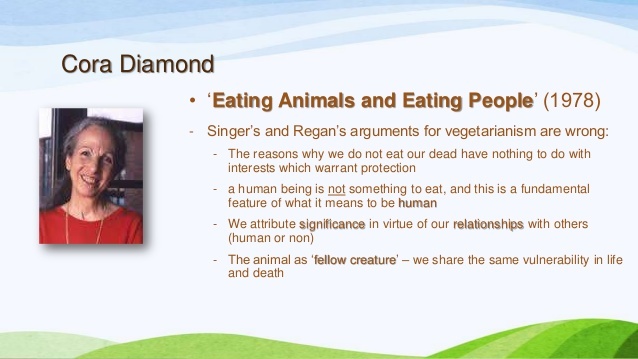 Diamond proposes there are ‘semiotic reasons’ why humans don’t eat each other; ‘If you eat your pet, then he or she wasn’t a pet, at that time anyway, even though many of them would make excellent repast’ as would ‘our own severed limbs’ (Bellamy). This conversation, rich with compelling cannibalistic narratives, closed the session. Next month we will be reading works by Josephine Donovan and Lori Gruen, discussing the connections between feminism and animal studies. The group meets on the last Monday of the month, between 6-7pm at Melbourne University – contact hrae-info@unimelb.edu.au for further details. Summary by Sue Pyke in close consultation with Des Bellamy, Shan Crosbie, Laura Jean McKay, lynn mowson, Norie Neumark and Stanislav Roudavski. This entry was posted in Blog, In the News, News. Bookmark the permalink.